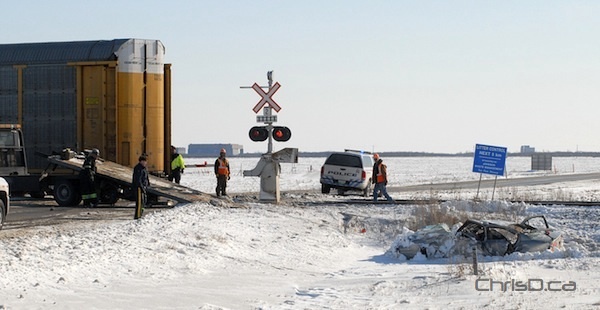 A 29-year-old Portage la Prairie woman is in critical but stable condition after being hit by a train on Sunday. The accident happened shortly after midnight in Portage at the intersection of Fisher Avenue and 8th Street NW. The woman was found near the railroad tracks and transported to Portage General Hospital before being moved to Winnipeg. RCMP say the victim was walking near the tracks when the slow-moving eastbound cargo train hit her. Portage RCMP and CN Police continue to investigate. An investigation into what caused a CN train to derail in Winnipeg on Saturday is underway. The derailment happened at about 10:30 a.m. near Pembina Highway and the Jubilee Overpass in the Fort Rouge area. Six train cars could be seen on their side, while two remained upright. A large crane was brought in to stabilize the cars, which weren’t carrying an hazardous materials at the time. Alcohol is believed to be a factor in a crash that left one person dead Sunday morning after a pickup truck collided with a train. RCMP say just before 2:30 a.m. a Ford pickup truck collided with the side of a westbound CN freight train on Edgewood Road in the RM of Springfield. Three people were in the truck travelling westbound at the time of the crash, located south of Highway 15 about eight kilometres west of Anola. The male driver and a female passenger were taken to hospital with undetermined injuries. Another man was pronounced deceased at the scene. The railway crossing was marked with crossing signs and a stop sign, police say. One man was sent to hospital Saturday afternoon after his vehicle hit a train at Sturgeon Road and Inkster Boulevard. The crash happened around 1 p.m. when the Oldsmobile Alero travelling southbound crashed into the train. The crossing was controlled with an arm, which was down at the time. The vehicle was dragged for about 20 metres down the CP track. The driver is being treated at the Health Sciences Centre for undetermined injuries. The first year of infrastructure upgrades to Canadian Pacific’s North Main Line between Winnipeg and Edmonton is complete. The $250-million, three-year project stretches approximately 850 miles spanning three provinces, and allows the railway to increase capacity and service reliability for customers, including agricultural, fertilizer and energy producers. About 155 miles of track was completed during 2011, including rail and tie upgrades, new and extended sidings, and public crossing upgrades. The remaining part of the project also calls for enhancement efficiencies at CP yards in Saskatchewan. A man was killed Thursday afternoon in an accident with a CN freight train in the RM of North Norfolk. RCMP say a 2004 Ford pickup truck travelling northbound on PR 34 collided with the eastbound train about three kilometres north of Austin, Manitoba. The crash happened at about 5 p.m. and sent three children in the truck to hospital with undetermined injuries. The driver was pronounced deceased at the scene. The crossing was controlled with lights and crossing arms. Visibility at the time was reported to be poor with blowing snow. The man’s name won’t be released. UPDATE: Friday, February 18 — RCMP say the deceased is a 36-year-old man from the RM of North Cypress, Manitoba. An 11-year-old boy and 17-year-old girl remain in critical condition, while a 15-year-old boy is listed in stable condition. UPDATE: Thursday, February 24 — The 11-year-old boy succumbed to his injuries in a Winnipeg hospital on February 22. A collision between a sedan and a CN freight train has claimed the life of a 77-year-old Anola man. RCMP and emergency personnel responded to the crash at about 12:30 p.m. on Tuesday three miles west of Anola. The crash occurred on Millbrook Road just south of Highway 15 when the man’s 1990 Ford Taurus travelling southbound was struck by the westbound train. RCMP say the crossing was controlled with a stop sign and that road conditions and visibility at the time were reported to be in good condition. The man was pronounced dead at the scene. His name isn’t being released. RCMP and CN Police continue to investigate.